At Esthetics813, we believe everyone feels more confident, freer and ready for anything when they live life Bare-Faced Naked. Where ever life leads you or regardless of your crazy lifestyle we have an in-office or home-care skincare plan personalized just for you! From lazy days by the pool, boardroom meetings & networking dates to cocktails and travels to far ends of the globe – we want you to live life Bare-Faced Naked. Thank you for trusting us with all your skincare needs. We love and appreciate you!!! Reveal the radiance and youthful look of your skin with our nourishing and rejuvenation facial treatments. We have designed specialized facial treatments to match your skin care needs. Unleash a slimmer, toner and more confident version of you. From body waxing to body wrapping, we have your body pampering needs covered. Who says pampering is only for women? Find time to relax even if you have a busy schedule. Visit our spa to experience our facial and body treatments fit for a king. Indulge in the exceptional beauty and wellness treatments that we offer. Confirm your appointment with our spa experts via phone or online. Our owner, Kyymara Rose, graduated from Aveda as an esthetician and is a licensed beauty specialist. By focusing on the latest in therapeutic facial massage, cosmetic facials tools, and sculpting body treatments, Kyymara brings her clients the best in beauty care products and services. She is dedicated to catering to her client’s needs and concerns by creating treatment plans that will result in healthy, radiant, and youthful skin and providing maintenance tips. Her goal is for you to look great bare-faced naked. "Kyymara was wonderful, very knowledgeable about her profession." 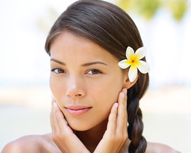 "My esthetician was very knowledgeable about my skin type and the products she used. She suggested things that I should do to improve my skin. I left there feeling very relaxed and beautiful. Thank you Kyymara you made my day." "Kyymara did a fantastic job. I left with my skin feeling refreshed and looking great. I will definitely be booking another appointment!" Experience an overall beauty care treatment with the seasoned beauty specialists at Esthetics813. Schedule your appointment online. For more information about our beauty care services, give us a call.